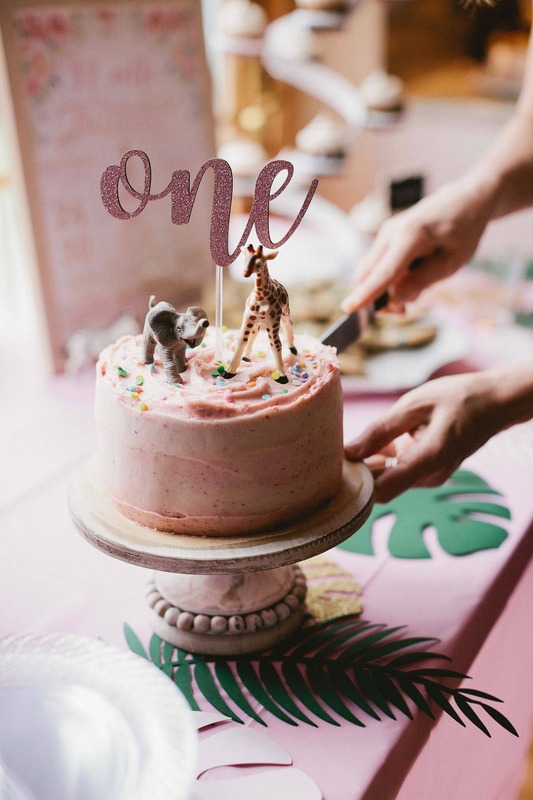 Simply decorated baby girl’s 1st birthday cake for a pink safari themed birthday party! 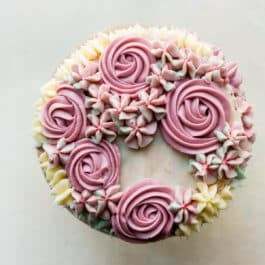 I’ve made hundreds of cakes, but you’re looking at the most special. My daughter’s 1st birthday was the other week and today I’m sharing the 1st birthday cake I created for her big day. 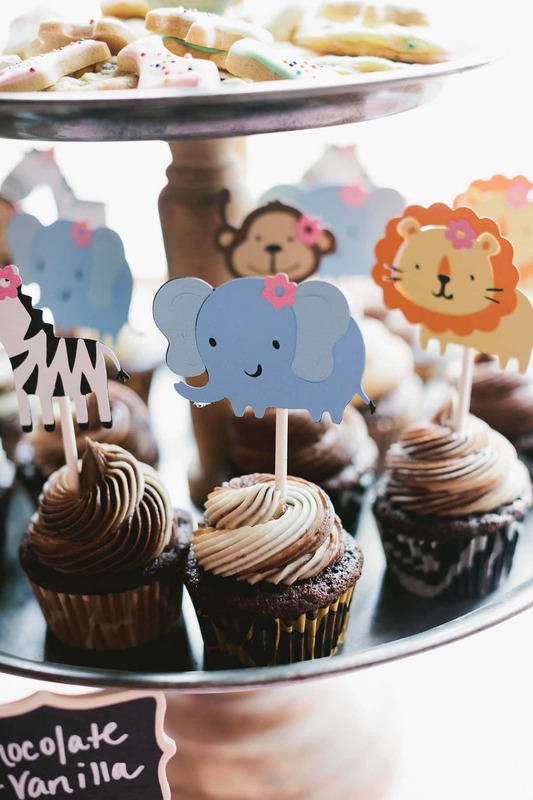 Noelle’s 1st birthday party had a loose theme of pink + safari animals, just how her nursery is decorated. I decided a petite zebra cake with strawberry frosting was best for the occasion. 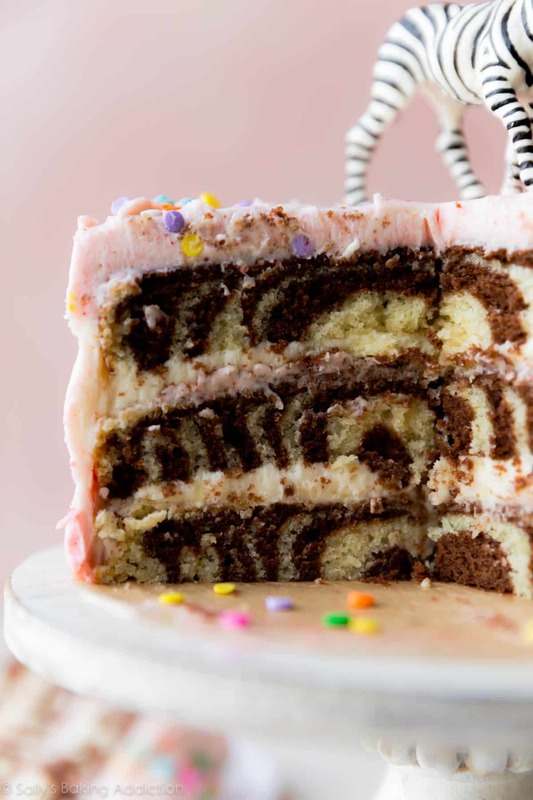 This is a 6-inch zebra cake, which is chocolate and vanilla cake batter layered into cake pans to resemble zebra stripes. It’s scaled down from my original 9-inch version. 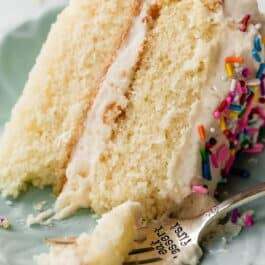 It’s filled with vanilla buttercream and the outside is frosted with naturally colored and flavored strawberry frosting. 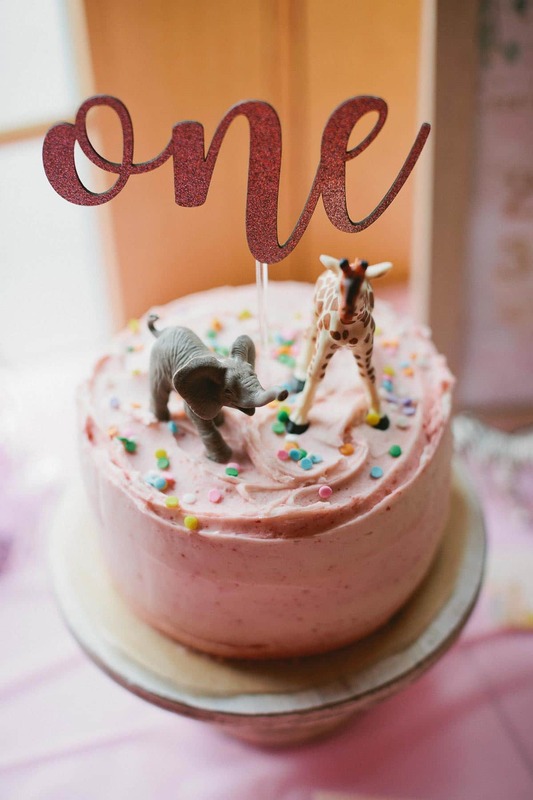 The top is garnished with rainbow sprinkles, a one cake topper, and adorable little animal figures I found at the craft store Michaels. Thank you so much for the inspiration and idea, Facebook group member Amanda! The cake decoration was simple and pretty. 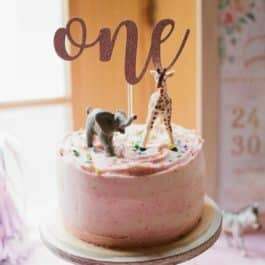 I was so busy leading up to her 1st birthday party and there were so many other desserts that I kept the cake decoration easy. Friends and family LOVED it! The 6-inch zebra cake turned out even better than the original; it was more buttery and moist, the perfect complement to both vanilla and strawberry frostings. Have you made my strawberry frosting before? It’s made from freeze-dried strawberries, so it has zero artificial flavor and color. You can find the video displaying exactly how to layer in the cake batters in the original zebra cake blog post. It’s surprisingly easy! 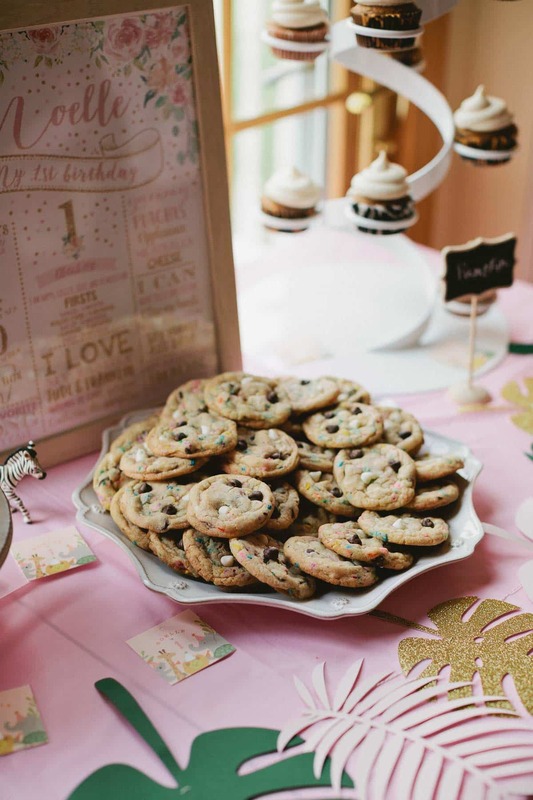 The cake was accompanied by a dessert spread of animal cracker cookies, cake batter chocolate chip cookies (a must for ALL parties! ), pumpkin cupcakes with cinnamon cream cheese frosting, and chocolate cupcakes with swirled frosting. 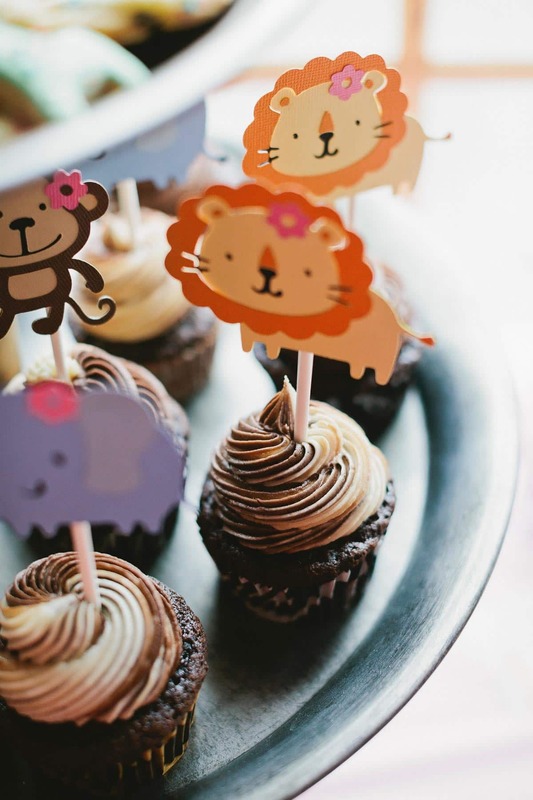 The animal cracker cookies were a hit with kids and adults alike and the cupcakes were a great option since the birthday cake was on the smaller side. It was a big party with lots of dessert, so I began preparing in advance. 10 days before: Bake all the cookies, cupcakes, and cake layers. Let them cool, then freeze the unfrosted treats in large zipped-top bags and Tupperware containers. Wrap each cake layer individually in aluminum foil before placing in a bag or container to freeze. 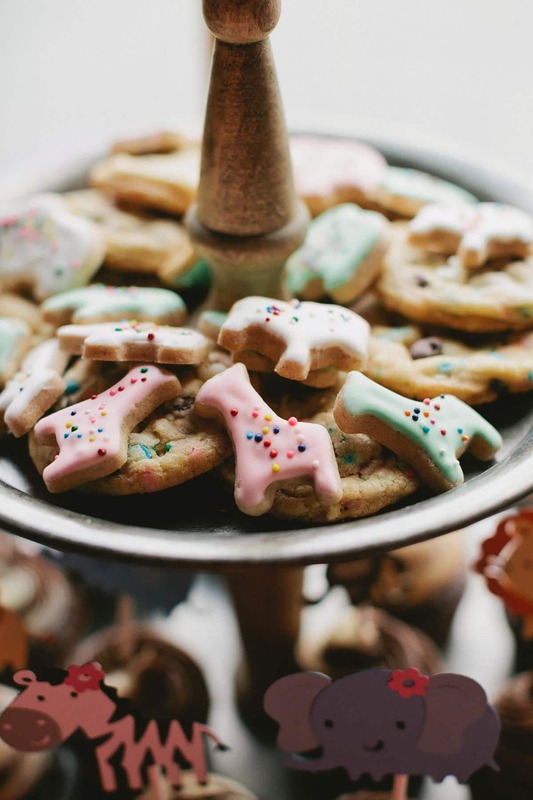 2 days before: Make the icing and decorate all the animal cracker cookies. Cover and store at room temperature. 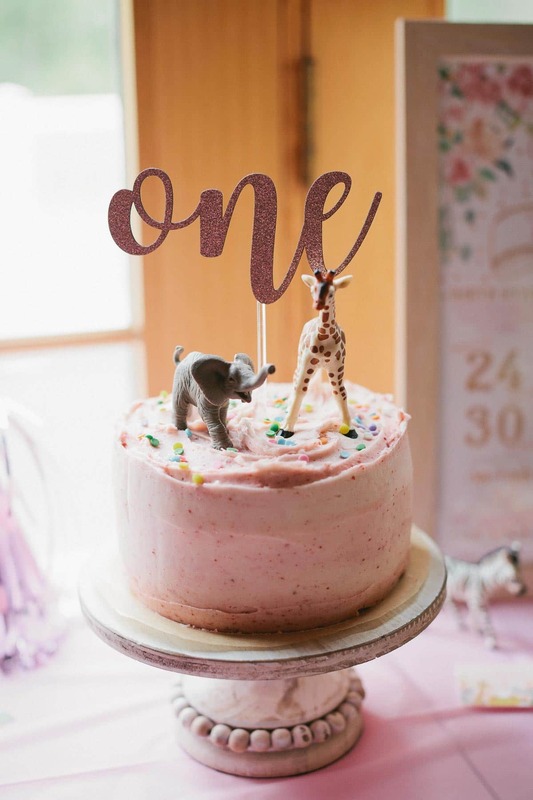 Day of the 1st birthday party: Frost/decorate the cake. Remove cupcakes from the refrigerator and bring to room temperature. Here are all the extras to make dessert extra special! 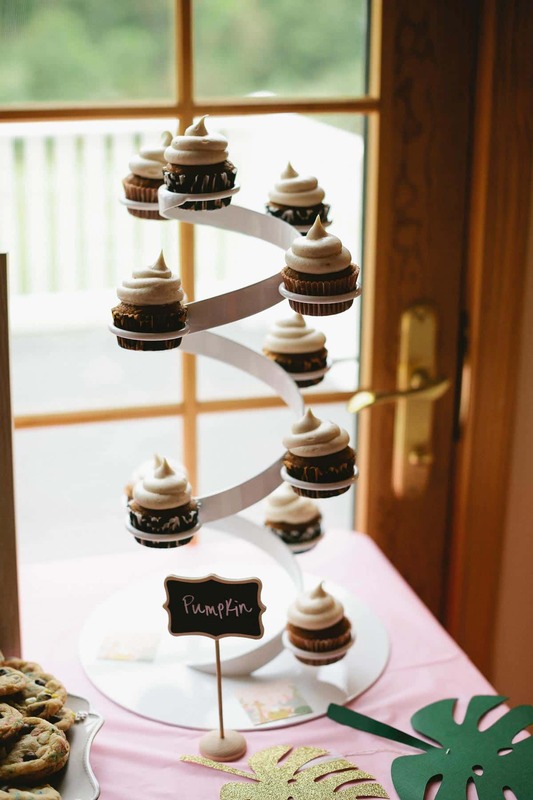 The spiral cupcake holder was a gift and I can’t find one exactly like it, but here is a similar cupcake tree stand. The small cake stand for the cake is also from Magnolia Home, but I see it’s now discontinued. 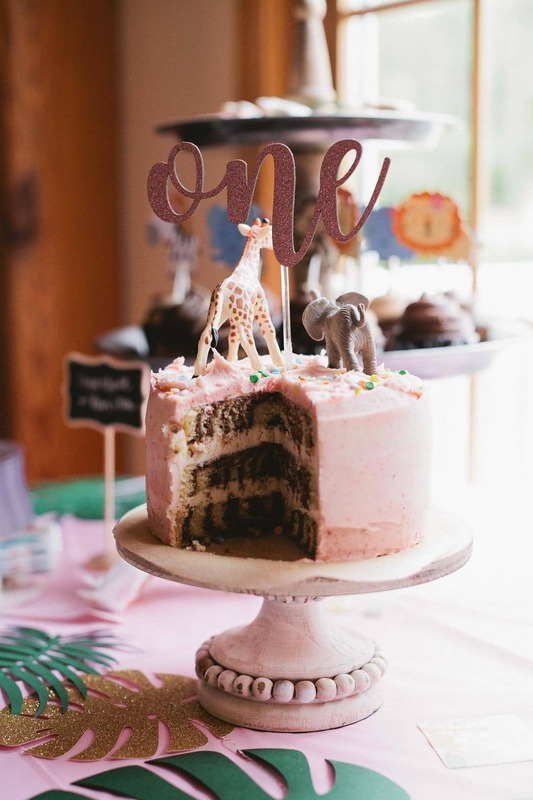 I find 6-inch cakes look best on 8-inch cake stands. Gives a little room on the sides! Noelle had her own slice of cake, which ended up mostly on her hands and face. After using both hands to pick up the slice, she pressed it into her face and beamed with excitement. So hilariously cute. Her first taste of dessert. 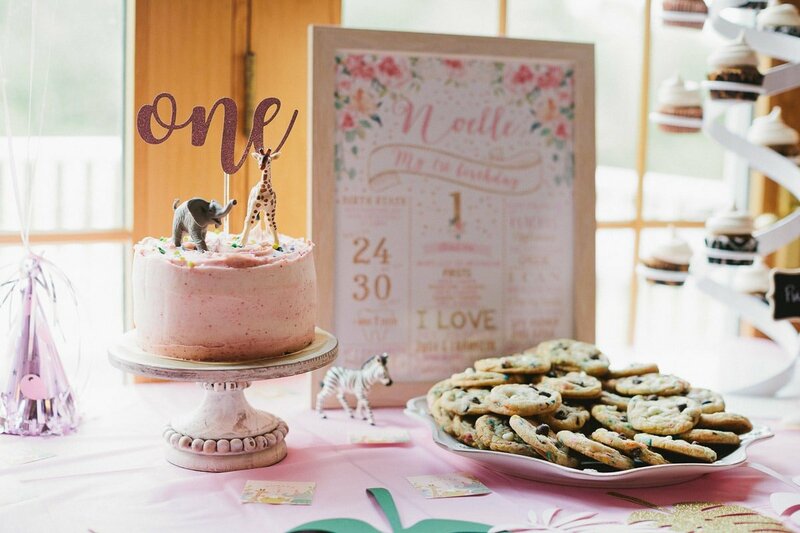 ♥ Birthday hat and highchair banner from Etsy, though I can’t find the listing from the shop anymore. It was the perfect dessert menu for our celebration. This is a wonderful small cake for any and all birthday parties! Make the vanilla batter: Whisk the flour, salt, baking powder, and baking soda together in a large bowl. Set aside. Using a handheld or stand mixer fitted with a paddle or whisk attachment, beat the butter and sugar together on high speed until smooth and creamy, about 2 minutes. Scrape down the sides and up the bottom of the bowl with a rubber spatula as needed. On medium-high speed, beat in the eggs, sour cream, and vanilla extract. Scrape down the sides and up the bottom of the bowl with a rubber spatula as needed. Make the chocolate batter: There will be around 4 cups of batter total. Transfer half of it to another bowl. 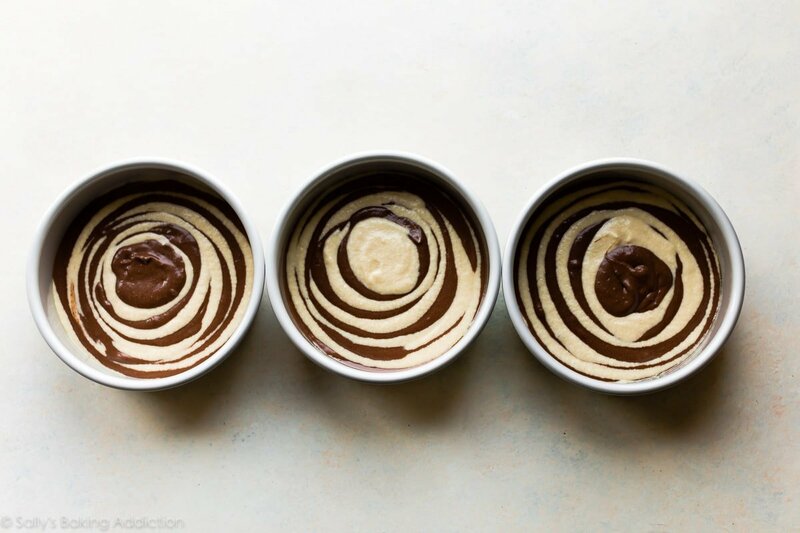 Whisk in the 3 chocolate batter ingredients until combined. A few small lumps are ok.
Watch the video in the original cake recipe to see exactly how to layer the batters into the cake pans. Drop a large spoonful of 1 batter in the center of the pan. Top with a spoonful of the other batter. Alternate spoonfuls on top of each other. Give the pan a shake to level it all out. Repeat with each cake pan until all the batter is used. Bake for around 19-22 minutes or until the cakes are baked through. To test for doneness, insert a toothpick into the center of the cake. If it comes out clean, it is done. Allow cakes to cool completely in the pans set on a wire rack. The cakes must be completely cool before frosting and assembling. Make the frosting: Using a blender or food processor, process the freeze-dried strawberries into a powdery crumb. You should have around 1/2 cup. Set aside. In a large bowl using a handheld or stand mixer fitted with a paddle or whisk attachment, beat the butter on medium-high speed until creamy, about 2 minutes. Add confectioners’ sugar, cream, and vanilla. Beat on low speed for 30 seconds, then switch to high speed and beat for 2 minutes. Taste. Add a pinch of salt if frosting is too sweet. Set 1 heaping cup of frosting aside; this will be the vanilla frosting for the inside the cake. 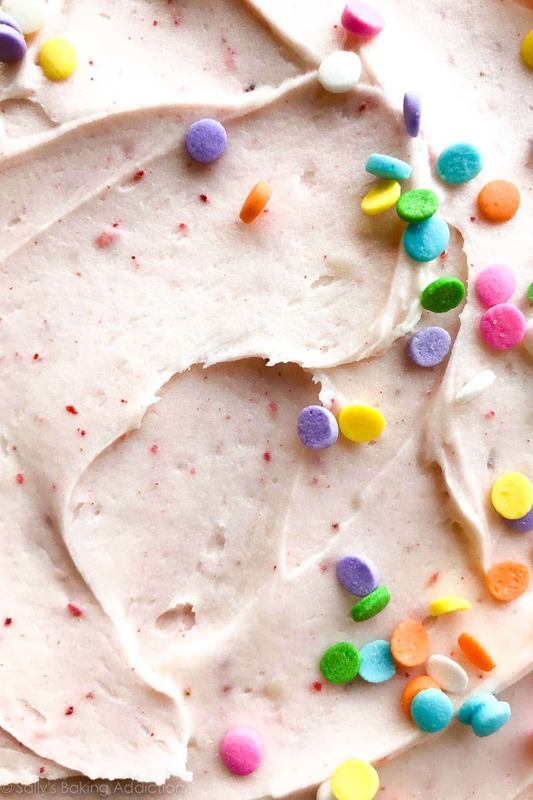 Beat the strawberry powder into the remaining frosting until combined. Assemble and frost: First, using a large serrated knife, slice a thin layer off the tops of the cakes to create a flat surface. Discard or crumble and use as cake garnish or enjoy over ice cream! Place 1 cake layer on your cake stand or serving plate. Evenly cover the top with 1/2 of the vanilla frosting. Top with 2nd layer and evenly cover the top with the rest of the vanilla frosting. Top with the third cake layer. Spread the strawberry frosting into a thick layer all over the top and sides. Garnish with sprinkles, if desired. Refrigerate for at least 30 minutes before slicing. This helps the cake keep its shape when cutting. Make Ahead Instructions: The cake layers can be baked, cooled, and covered tightly at room temperature overnight or frozen up to 3 months. The frosting can be prepared then covered and refrigerated overnight. Let the frosting sit at room temperature to slightly soften for 10 minutes before using. 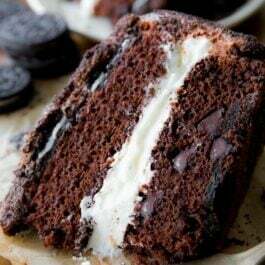 Frosted cake can be frozen up to 2-3 months. Thaw overnight in the refrigerator and bring to room temperature before serving. Milk: If needed, you can use whole milk mixed with 1/2 teaspoon of white vinegar or fresh lemon juice instead of buttermilk.